CDO or Chief Data Officer is a C-level corporate executive of an organization who is responsible for data governance. It is the role of the CDO to ensure that business users can easily access all the relevant data as well as reporting tools, and also guarantee the data quality. Apart from that, CDO is also responsible for safeguarding the information, take care of its privacy, and manage the data lifecycle as well as its quality management, and other operations. If you are planning to reach the CDO’s of several businesses, we are here to help you. 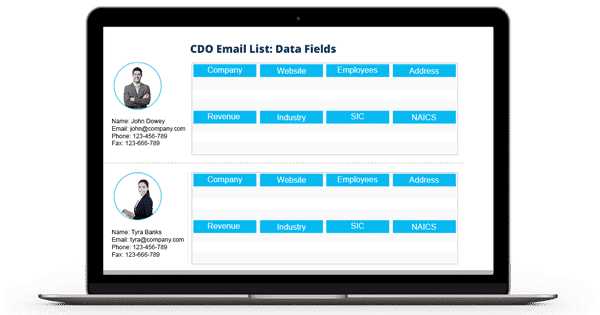 Blue Mail Media provides the highest quality CDO Mailing List that lets you have seamless interaction with the data officers without any boundary constraints. With our list, you can execute multi-channel marketing campaigns and thereby improve your sales rate dramatically. Besides, our GDPR compliant list provides all the necessary marketing information that assists you to take the right decision. We, at Blue Mail Media, provide you the Chief Data Officer Mailing List in both the pre-packaged and customized format. You can customize the database based on your business requirements. And, this personalized data helps you to focus on a specific set of target audience and yield a better result. Also, our list lets you reach international market smoothly. It provides the data of CDO’s residing or working in several regions across the globe such as USA, UK, Europe, Russia, Africa, North America, South America, Asia, and others. To ensure the accuracy as well as reliability rate of our list, our team of data experts updates it for every 90 days. They make thousands of verification calls and send thousands of verification emails to provide you the error-free data. Also, they collect the data for CDO Email Database from various trusted sources such as yellow pages, surveys, business directories, conferences, trade shows, government records, and more. Buy our CDO List and plan your future campaigns efficiently. You can either dial 1-888-494-0588 or send an email to sales@bluemailmedia.com for more information! Our team of data scientists, analysts, and experts constantly dig out the most qualitative data to power your multi-channel marketing strategies. Also, we ensure that our List of CDO Email Addresses remains accurate and updated by making thousands of verification calls each day and sending out verification emails.